Have you ever heard of Google Keep? Its a little known google app that lives in your gSuite account and if you have not tried it for few months it may be worth your while to give it another look. So what is Google Keep? If you are familiar with Evernote or even Apple’s notes app then you probably have some idea. Basically a note taking program that syncs across all your devices. So what are some of the uses that you can put it to? Take notes at a parent teacher conference. Capture photos of a conference presentation. Share action items with your team. 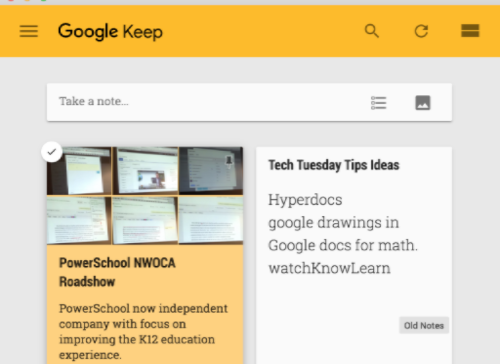 Google Keep is available in apps and as a chrome application. It works in iOS and Android as well as in your favorite browser. Give it a try and see if you find it useful. I certainly did this week.